Although you may disagree with me, I'm putting the "easy" designation on this bird rather than the next one for two reasons. First, I think this bird has more readily recognizable diagnostic features than our second quiz bird. Secondly, for reasons we will discuss, I think our next bird is more easily and more frequently overlooked than this one. All our quiz birds would appear to be buteos because of the long, broad wings, but the wings of our first bird seem exceptionally wide--so wide, in fact, that the tail looks stubby compared to the other two. The tail itself, dark with a single wide white band and a very thin white terminal band is a dramatic diagnostic clue for this bird's identity. A third identifying feature visible in this ventral view is the white patch at the base of the outer primaries. The bird's body, tail, and underwing coverts are certainly very dark, if not black. How many dark Southwestern raptors are there? Common Black Hawk, Zone-tailed Hawk, and Harris's Hawk are the only three. Those noticeably broad wings, attributable to its very long secondaries, are the most diagnostic feature you'll need to look for on Common Black Hawk, this one photographed July, 1998 in the Verde Valley. In color and with good light, the lighter coloration and chestnut markings of Harris's Hawk should make distinguishing it from Common Black Hawk fairly easy. In poor light notice the white areas of the Harris's proportionately longer tail are at the base and at the end, giving the appearance of a white tail with a very broad dark band--quite different appearing than the Black Hawk's white median band on all dark tail. On flying birds such as we have here, when separating Black Hawk from the similar slate-to-black appearing Zonie, always begin with wing structure. Sometimes tail bands may be obscured by angle of flight, but the broader, shorter appearing wings of the Black Hawk should be readily apparent with a few moments glassing. On perched birds look for three differences also. The Black Hawk's cere (bare skin above the upper mandible), facial skin, and legs will be orange-yellow, whereas the Zonie's cere and legs will be yellow without the orange tones, and its facial skin will be pale yellow to gray. The net effect is that the Black Hawk appears contrastier overall and a more colorful bird. Perched, the Black Hawk's wings will not quite reach the tail tip. The perched Zonie's will. Perched, with tail folded up, the Black Hawk's tail will show its white band both top and bottom. Perched, with tail folded up, the Zonie will also show only one band top and bottom, but it will be white from below, gray from above. Here's your trivia fix for this issue's quiz. Buteogallus anthracinus, the scientific name for Common Black Hawk, is partially derived from the Latin gallus, which is "chicken." This, then, is the real Chicken Hawk. I've always heard snake and amphibian taste like chicken. Here's our Zonie, photographed in Harshaw Canyon near Patagonia July, 1993. This can't be a Harris's Hawk with those multiple zones of white in the undertail, and those long slabs of wings, quintessentially buteo shaped, are much too long and narrow for a Black Hawk. If you think Zone-tailed is an easy bird, ask yourself these questions. How many Black Hawks have you overlooked, and how many Zonies? My answers would be "not many" and "probably hundreds." Black Hawks are loners, and they are usually closely associated in breeding season with riparian areas. Even at some distance their unique wing shape and striking tail pattern will stand out. Zone-taileds, with their much broader geographical distribution, somewhat broader ecological niche, and seemingly greater penchant for soaring the thermals with other raptors are often dismissed as . . . some other raptor. One spring morning along Proctor Road below Madera Canyon I counted seventeen dark raptors riding a thermal--fourteen Turkey Vultures, two Golden Eagles--there must be a Zonie up there somewhere. There was, but it was the last one I identified out of the group, it took me fifteen minutes, and it only happened because the bird finally passed directly above allowing a view of the undertail. Like TVs, Zone-taileds will fly with wings in a dihedral (upslanted into a "v"), they will rock back and forth on the currents, and their flight feathers will appear silvery, giving the underwing a two-toned look. The tail zones, narrower than a Black Hawk's, are not immediately apparent at any distance. Remember the Southwestern raptor aphorism. "To find a Zonie, glass every TV." Our quiz bird is a female. Males' tails have only one narrow white band, not two. This is not a Harris's Hawk. It is much too light. This is not a good photo. It is much too grainy. This Gray Hawk, photographed over Arivaca Cienega July, 1997, was flying much higher than our previous birds. It's easy to see the loss of detail in the blow up to make the image size comparable to that of the previous birds. Gray Hawks generally seem less comfortable than most raptors directly overflying observers on the ground. I've yet to get the Gray Hawk flight shot I want. 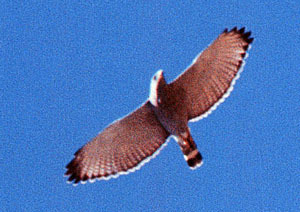 The dark tail with two white bands, the narrower one just barely visible at the tail's base, and the light, relatively unmarked underwings with dark primary tips and dark trailing edges mark this as our fourth Southwestern specialty raptor, unlike any other raptor except Broad-winged Hawk. Broad-wingeds pass through Arizona, in very low numbers, in spring and fall. From below look for the square white panel at the base of the Broad-wingeds primaries. From above look for the white "u" of the Gray Hawk's uppertail coverts. Often called "accipiter like" because of its long tail and small size, the Gray Hawk can be separated from adult accipiters by its overall lighter, gray coloration and less prominently barred flight feathers. Immature accipiters are separable from adult Gray Hawks by their equally widthed, multiple tail bands. Immature Gray Hawks . . . we'll have fun with immature raptors in a future photo quiz.